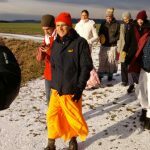 Maharaj arrived in Prague on Tuesday, 12 January, and he immediately set-off on a 350 km journey to the Bhakti Yoga Centre in a village called Studenka, where he spent three days. 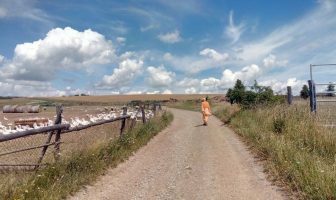 He was accompanied by about twelve devotees and at the Bhakti Yoga Centre, there are eight devotees staying permanently. Maharaj’s visit there was very exciting. 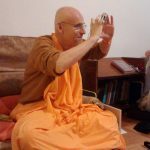 He gave morning and afternoon lectures, led wonderful kirtans, met with devotees and went out for walks in nature. On Friday afternoon, Maharaj moved on to Nava Nandagram. The temple boasts the biggest temple room in the Czech Republic and it was crowded with devotees from around the country and various corners of Europe. 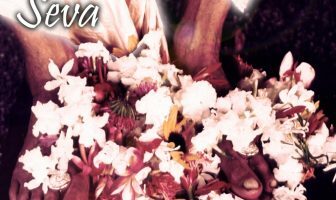 At the evening program on Friday, Maharaj first led a long kirtan for the pleasure of Sri Sri Krsna Balarama, Gandharvika Giridhari, Laksmi Nrsimha, Gaura-Nitai and all present vaisnavas. 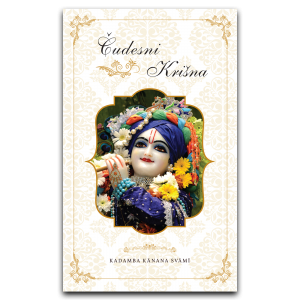 A nice surprise was an unplanned lecture on Saturday morning, where Maharaj mentioned that we are servants of Krsna not only on a part-time basis but full-time, and that we have to give preference to Krsna over anything else. We have to be determined to continue in our service despite whatever happens, in any circumstances, and if we do so, we will be those who survive! 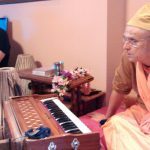 Before noon that day, Maharaj set-off to Harinam Mandir in Prague. He was travelling in a Skoda and was followed by another two cars of the same brand, which is often the object of Maharaj’s jokes when he is in Czech! 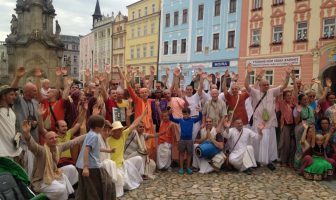 Harinam Mandir is a preaching centre in downtown of the Czech capital and it is well known for being nice and warm. 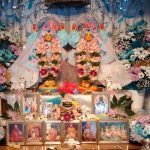 This was noted by Maharaj as he mentioned that the best heaters are bodies and in Harinam Mandir, it was really jam-packed that some devotees had to stand in the corridor! The Sunday morning lecture was given at the temple in Luzce as part of an initiation ceremony. Bhaktin Karin is now Kavita Devi Dasi. 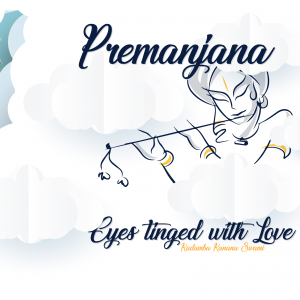 The lecture was based on Srimad Bhagavatam 2.3.13 and dealt with the twenty-six qualities of a devotee. 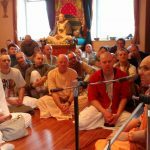 The typical Sunday afternoon program consisted of ecstatic kirtan, lecture and feast with a full-house in attendance. On Monday, Maharaj had planned to take rest but he suddenly changed his mind and he left for Amsterdam. What more to add – the time with Maharaj was filled with amazing moments that you never wanted to end. 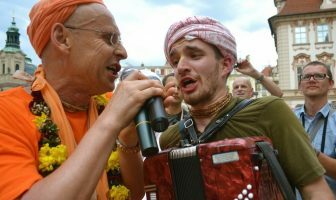 Videos and mp3 from lectures and kirtans will be published soon! Visit Flickr to see all the photos. 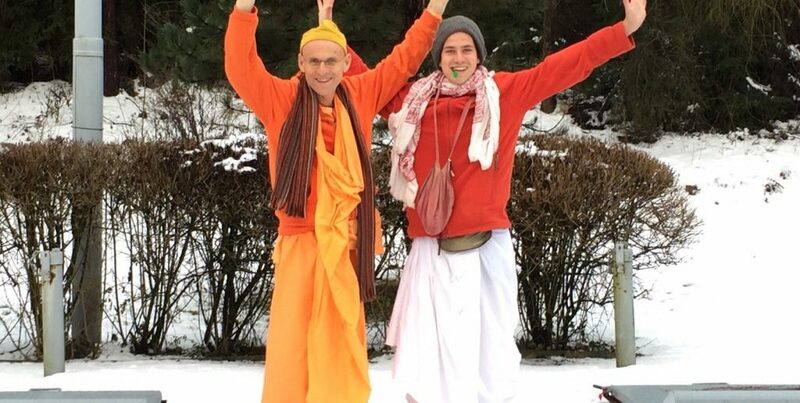 so wonderful to read about maharaj….thanks for sharing.